organ. There is no entrance fee but rather a free will offering to cover any costs. All are welcome! Refreshments to follow concert. 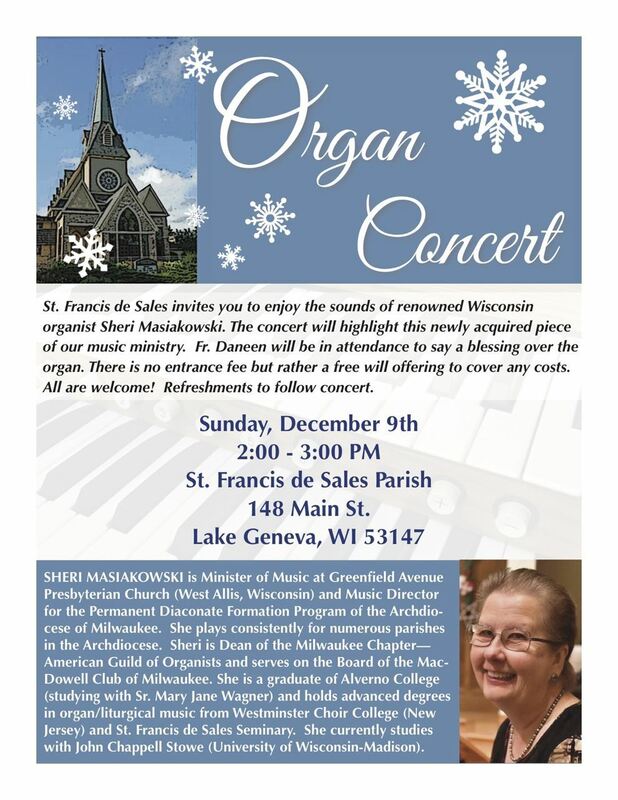 SHERI MASIAKOWSKI is Minister of Music at Greenfield Avenue Presbyterian Church (West Allis, Wisconsin) and Music Director for the Permanent Diaconate Formation Program of the Archdiocese of Milwaukee. She plays consistently for numerous parishes in the Archdiocese. Sheri is Dean of the Milwaukee Chapter— American Guild of Organists and serves on the Board of the MacDowell Club of Milwaukee. She is a graduate of Alverno College (studying with Sr. Mary Jane Wagner) and holds advanced degrees in organ/liturgical music from Westminster Choir College (New Jersey) and St. Francis de Sales Seminary. She currently studies with John Chappell Stowe (University of Wisconsin-Madison).